The only televised debate between B.C. 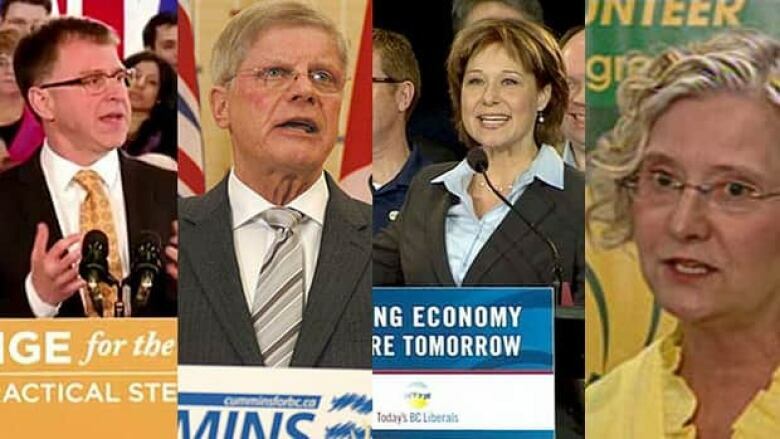 's four main party leaders will take place on April 29, 2013 from 6:30 p.m. PT to 8 p.m.
CBC will broadcast the debate live on radio, television and online, along with several other local broadcasters. Veteran B.C. broadcaster Jennifer Burke will moderate the debate between B.C. Liberal Leader Christy Clark, NDP Leader Adrian Dix, Conservative Party Leader John Cummins and Green Party Leader Jane Sterk . "The format of the event will contain plenty of opportunity for pointed questions inspired by voter concerns and head to head debate between individual party leaders," said a statement released by the British Columbia Broadcast Consortium. You can follow the leaders's debate on Twitter at #bcdebate2013. The B.C. election will take place on May 14.